With The Daily Mail recently reporting that supermarkets charge 4 times the online price for food in store, this may have led you to make the decision to do all of your food shopping online. However, supermarkets may be forced to hike up delivery charges for online food deliveries to as much as £15, due to the service being unprofitable for many supermarkets. Demand for home delivery has grown so dramatically, with Waitrose revealing last month that online sales have increased 55 per cent year on year for the higher end supermarket. According to retail analyst Dr Clive Black, head of research at Shore Capital Stockbrokers, finding your items, bagging them up and delivering them to your door typically costs supermarkets up to £20, which is approximately four times the usual charge for the service. 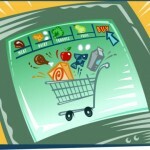 “Online grocery without proper charging for distribution is not a sustainable model. The big supermarkets currently offering home grocery deliveries are Tesco, Waitrose, Asda and Sainsbury’s, Morrisons and Marks and Spencer are yet to follow. Dr Black believes it is the cost of delivering the items which is putting off companies to offer home delivery for food shopping. What do you think? Do you think it’s only fair that supermarkets push up the price of their delivery charges? And would it stop you from shopping online?